On May 7th, Ali’s ant gold suit suddenly started to force its way into the shared car sector and led the share of the car brand – travel immediately. BEIJING – On Valentine’s Day, shops and stores often make promotions to attract couples, but it is Beijing singles who are benefiting this year. Gofun Chuxing, a company which provides car-sharing services in Beijing, placed a random 100 cars in the street to offer free use for singles. A gift pack including Gofun car rental coupons is an extra surprise. Gofun is using the idea to raise its popularity and promote car-sharing among young people. Gofun was launched in February 2016 by Beijing Shouqi Group, a leading auto leasing company, as the sharing economy started to flourish in China. After downloading an app, registering an account, uploading an identity card and driving license, Liu Xiaoqian, 26, finished the registration process in minutes. Apart from a refundable deposit of 699 yuan ($102), she only spent one yuan per kilometer and 0.1 yuan per minute for her drive. “Gofun has put 1,100 cars in Beijing and we aims to have more cars if we get more car licenses,” said Tan Yi, Gofun chief operation officer. “We had a pretty good market performance last year. Our cars were borrowed at least once each day, running about 30 kilometers on average, equal to an office worker’s average commute each day,” Tan said. In other cities, car-sharing services are also springing up. Car2go, a car-sharing service provider under automotive giant Daimler AG, was launched in April 2016, in Southwest China’s Chongqing municipality, the first city Car2go chose to enter in the Asian market. More than 400 Benz Smart cars were put into major urban areas of Chongqing, covering 60 square kilometers, the company said. By now, Car2go has more than 118,000 registered members and has offered over 115,000 car services in Chongqing, now a top 10 Car2go city. “Car2go is a ‘free flow’ car rental and sharing service model. It makes a full combination of car and smartphone technology,” said Guan Guozheng, chief operation officer of Car2go, China. Car2go asks for a 99 yuan deposit and 1.19 yuan per kilometer and 0.59 yuan per minute per drive. Fees for parking, insurance and gasoline are included. As more people choose car-sharing, the service has encountered problems such as theft of cars and a lack of parking. “Every car is installed with a global positioning system. We are following the car in case it is stolen,” said Wu Mao, an employee with car-sharing company Youche, based in Guangzhou, capital city of China’s southern Guangdong province. The city already has five car-sharing companies in the market. 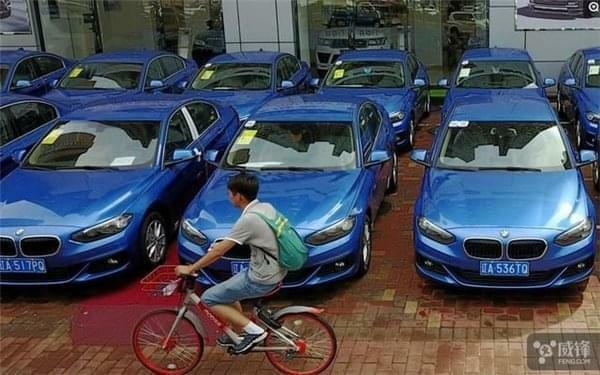 By June 2016, China had a total of 135 million private cars, making about 260 million trips a day, according to the Traffic Management Bureau of the Public Security Ministry.